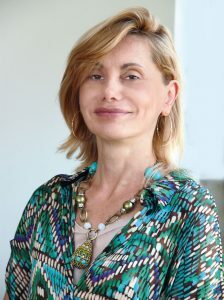 Odile Robotti is managing director and founder of Learning Edge srl (www.talentedge.it and www.learningedge.it), a training and HR consulting company and country lead in Italy for the 30% Club (https://30percentclub.org/about/chapters/italy). She is also author of a book (Il Talento delle Donne) and many articles on women empowerment and leadership. President of MilanoAltruista (www.milanoaltruista.org), a volunteering organization affiliate of HandsOn Network and of ItaliaAltruista (www.italiaaltruista.org) , a not-for profit organization, Odile is also adjunct professor at Università Vita-Salute San Raffaele (http://www.unisr.it/). Odile graduated in economics from Bocconi University. She also holds an MBA from SDA Bocconi Business School, a Ph.D in psychology from University College London and is a certified coach (CPCP) of the International Coach Academy. Self-confidence is the corner-stone of leadership and particularly difficult for many women for a number of reasons, including subtle undermining cues we are given. Plus, let’s be fair, the top of organizations is still mostly male and this certainly is not encouraging evidence. So we need to make conscious efforts to boost our self-confidence. If you succeed, it will exude from your behaviors (declarations not needed) and is contagious. Tip: keep a daily diary of successes and accomplishments, large and small, and re-read it. This will also be useful for the following point. 2. Build your self-brand and promote it. Find what the essence of your brand is by asking yourself what you are you successful at, enjoy doing and where you have achieved good provable results). Then create a narrative around it and start promoting your brand. This is difficult for us because we have been taught not to beat our own trump, but please don’t be fooled into thinking that performance speaks for itself (it is almost as mute as a fish). You need to let people know what you are good at. Tip: Talk about yourself to a trusted friend or colleague highlighting what you have achieved and ask honest feedback on how it sounded. Practice for a while with people who you consider “safe” and fine-tune your self-promotion style. As a policy: never down-play your successes and never self-denigrate. 3. Understand the rules of the game and have a game-plan. In general, women spend less time than men understanding the real rules for organizational success and in conceiving a game-plan for their career. I have seen many women get in the playing field convinced it was soccer game when it was actually rugby (I don’t need to tell you the outcome). Not all rules are written, some need to be induced from observation. Game-plans require strategizing and should be made with conviction and effort. Tips: First, observe your organization without preconceptions and deduce the rules. Check with others who are in the know. Find mentors and ask for advice. Second, make time in your schedule to reflect and come up with a game plan. This is real time you need to make, mark it in your calendar. Needless to say, if you can’t put up with the rules, you should start looking around. 4. Invest in your professional network. Typically women spend less time in professional networking, often find it awkward, and prefer deeper relationships with a smaller number of people than shallower ones with larger numbers. This is a legitimate preference, but one that comes with a high price-tag that you must be aware of. Your network can be the largest factor in creating opportunities, diffusing your brand, giving you access to information and knowledge. Advancing without the support of a large network is an uphill battle. This is an area that merits an investment of time and energy. Tip: Start by asking yourself what you can give others (Some particular knowledge? Access to resources and information? Understanding? Empathic listening?) and approach networking with a desire to share and give. 5. Accept that not everybody will like you and that you are not perfect. Women more than men seek likeability and perfection, probably to adhere to the nice-girl stereotype. Unfortunately, both are mission impossible and become a straight-jacket. Both should be abandoned (you will tell me how much time and energy this frees: almost more than needed to cover previous points). Tips: Substitute being liked with being respected (achievable and even better because it requires less compromises). Substitute being perfect with moving out of your comfort zone (i.e. trying something new and a bit scary). Doing this, you will probably make mistakes: a very good cure for Ms. Perfect, plus a great way to learn many new things, including that most mistakes don’t kill. Very useful tips – inspiring & actionable. Thank you!